Disclosure: Grandma Bonnie's Closet has not been compensated for the following book review. I received a copy of the mentioned books for review purposes. All opinions expressed are my own. Being a hiking family we have often wondered what plants might be edible on the trails we hike. When I was a child my mother and aunt would take us camping and hiking every summer. While hiking they would stop and pick different plants and berries to add to our camping meals. I can remember a few of the plants they would have us pick such as dandelions, elderberries, and other greens. It has been a long time since I have been out foraging in the woods. I am not certain I could safely identify many edible plants. I decided I would like to pass this family activity on to my grandchildren so I went searching for a book that would help me to identify edible plants in the wild. 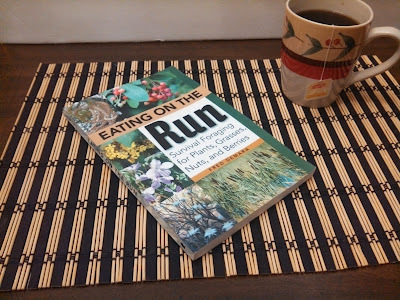 The book I found that would fit my needs was Eating On The Run, by Fred Demara. Here is a short description of the book. This book is considered a survival book. Even if you are not into the survival or prepper crowd this book can still be of use to you or someone you know. How many times have you heard about a hike or hunter getting stranded in some woods some where. You may have read how they survived for a week or more on berries, ants or some other edible item they may have found. My son and his wife camp, hunt and hike all over the country. I know this book would be perfect for them. We hope they never have to use it for survival but it would be good to know they have read this book. 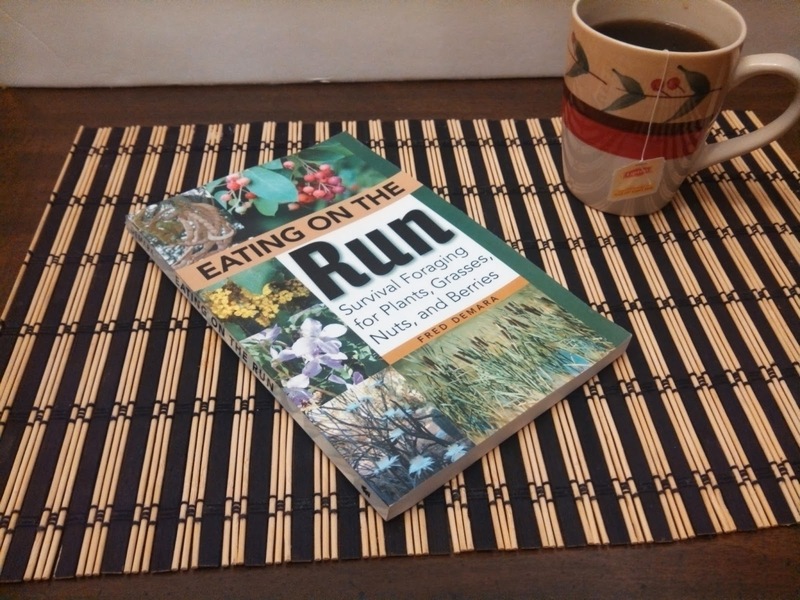 I am sure you want to know what kind of information you can find in Eating On The Run. You will find information on some plants you already know about such as prickly lettuce, wild raspberries, and wild blackberries. Then you will also find information on some plants you may have heard of but not seen, such as purslane or shagbark hickory. Of course you will also read about some plants you have never heard about before. For each plant listed in this book you will see a photo of the plant. You will read about the plants characteristics, taste, color and a good description of its appearance. You will read about the places it is likely to grow such as swamp, desert or woodland. Additionally, if there is a plant similar in appearance that is not edible you will read about that also. Finally you will also read about the ways to prepare the plant for eating and what parts of the plant are edible. One edible plant listed in this book is cattails. I actually had no clue that cattails were edible. This was very interesting to learn. Did you know that every part of the cattail plant is edible at some time? The common cattail is found all over the Northern Hemisphere. It is easy to identify and easy to harvest. The buck-wheat-like pollen at the top of the plant is high in protein. The shoots or stalks and young flowers are starchy and high in carbohydrates. The female part of the flower(Looks like a hot-dog at the end of a stalk.) may be boiled when immature and eaten like corn on the cob. 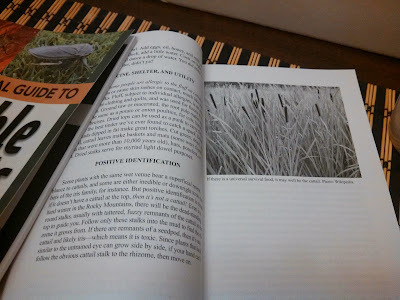 There is a recipe in the book for Cattail Pollen Pancakes of which i am planning to try next time we come across a stand of cattails in our area. The chapter on cattails goes on for eight pages and includes many ways to cook all the parts of the cattail plant. Near the end of the chapter it includes a paragraph about plants that have some resemblance to cattails that are not edible. Positive identification is simple if the plant does not have a cattail on top then it is not a cattail. I my self would prefer if I am unsure of any plant just do not eat it is my motto. I found this book to be extremely interesting and hard to put down. I would recommend this book to just about anyone who spends even a little time outdoors. 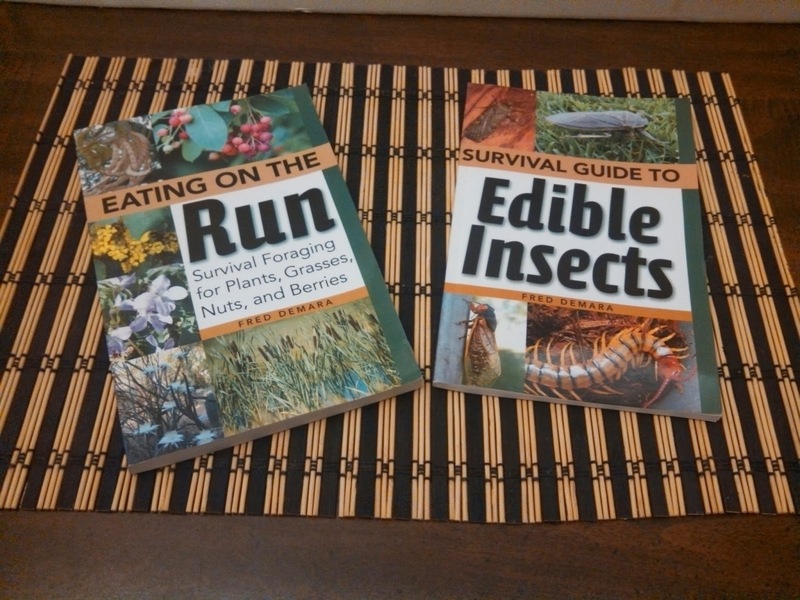 Paladin Press also was kind enough to send me the latest book written by Fred Demara titled "Survival Guide To Edible Insects". I felt I had to at least try to read this book before giving it away to someone who might want to eat insects. I was very glad I did. I learned a lot about insects that I just might try to cook if my family was hungry. Well, at least maybe I could cook them up for the guys while I munch on some cattails. So, you want to know what kind of information you will read about in this book. It is written in about the same way as "Eating On The Run" was. You will see photos of each insect, a description of the insect, where you might find them, and how to prepare them to eat. From ants, termites, houseflies and many other insects listed in this book you may just find a little something you might want to cook up and try. The one insect that I thought might be interesting to prepare for my family was the grasshopper. My husband claims when he was a child they would catch grasshoppers and roast them on a stick over the campfire. I would probably still stick to plant life if I had to forage for food but I would be OK making roasted grasshoppers for my family if they were willing to eat them. Follow Paladin Press on Facebook and Twitter. Another thing I wanted to say... The way the world is today... you better hang on to these books. Who knows when you might need to be finding food in the wild. Looks like a great book.. We do alot of hiking and I often wonder what we'll eat out there in the wild --IF we were stuck somewhere and had to find something... I may need to get that book. Thanks. There is NO way I could ever put a bug inside my mouth -even if I was starving. I just don't think I have it in me! sound really interesting but not to sure about eating bugs lol. This is definitely something I need for the area that I live in. I have always been worried about what I can and can't eat. That and I found out that a tree growing in out back yard was poisonous. I couldn't believe it! Thanks for sharing! Although I do not go hiking I think I would enjoy reading this book and learning about all the edible plants in the wild! This is SO cool! I was just talking with a friend today about edible plants - berries and mushrooms in particular. This would be great when the world comes to a food shortage. Would really contain a lot of knowledge. I would imagine that this would also be a great book to teach someone survival skills. One never knows when an emergency could happen leaving him or her to their own devices including gathering food. I know EXACTLY the person who would love these books and I do believe he'll be getting a couple for Christmas. Foraging is an important topic and "lost" on most of us. But the fact is kids (and adults!) should know where food comes from. I need these books. I have been looking for source like that. Wow, this looks like a great book for hikers. I have a couple that are good friends of mine that hike every weekend. This would be a great gift for them to receive for the holidays. Thanks for the review! Very interesting book! 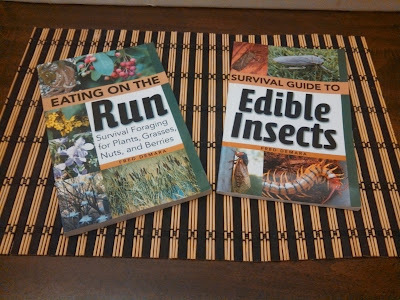 I have to say I think it's a good thing that they have these two books like these... who knows when you may need to be eating out in the wild - who knows what the future holds! I would find this book interesting, especially growing up country. We would eat a lot of things but I never tried the cattails. They were decorative in our house. These look like great books to have especially about what kind of plants and berries are safe to eat. I am not sure I could eat bugs though. yikes. I love books like this and think they are important. you just never know when or how you might be stuck somewhere and need to survive. I'd eat a plant first but if it meant survival I'd eat a bug too. These book look great. My husbands family has always picked mushrooms ect... every year. It's very common in the country they live in. They teach their kids at a very young age how to identify the different kinds that are safe to eat. I think it is very important knowledge to know.